Using video contents in projects or website headers has become a popular trend in web designing world. Compared to standard images, a well-placed snippets of high quality footage can really bring your project to life. These looping video clips can add more dynamism to a web page and improve user retention time on the site. Then, where to find high quality stock videos? Many stock video sites charge a subscription fee for their best content. Luckily, there are also a number of sites offering totally free high quality stock videos for both personal and commercial use. In this article, we have rounded up a collection of websites where you can download free and royalty-free stock videos in 4K or Ultra HD resolution. Take a look at the following list and find great videos to use in your projects, websites, social media posts, or ad campaigns. Videezy is the best source on the Internet where you can get free HD stock footage and 4K stock videos. Video clips are sorted under multiple categories like popular new videos, health & beauty, sports, music, travel, time lapse and many more. You can also search videos according to your need by searching tag or keywords in its dedicated search bar. All the videos available on this site are royalty-free and you can download 4K and Ultra HD stock videos free of charge. Pixabay is best known for the high quality photos collection, but it also has a huge library of 4K stock videos and Ultra HD stock footage that available for free download. This site has more than 1.8 million stock videos and photos for free download. The stock videos are shared by their generous community members, so all the videos available here are totally copyright-free and royalty-free. 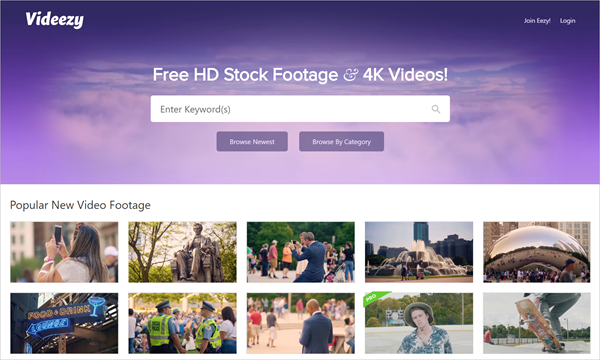 If you are also a videographer who wants to share 4K stock videos to others, then you can simply join the Pixabay community by registering on the website. 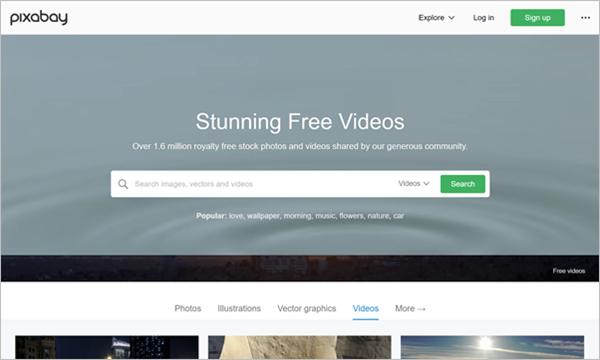 Videvo has a huge collection of stock videos in Ultra HD or 4K resolution for free download. It is a community-based network and members of the community share their creative stock videos for free. You can choose and use them for personal and commercial purpose. But first, you should consider that under which license that the video falls. Videvo Standard License – where you can use videos without attribution. Videvo Attribution License – where you have to give credit to the owner of the stock video clip. 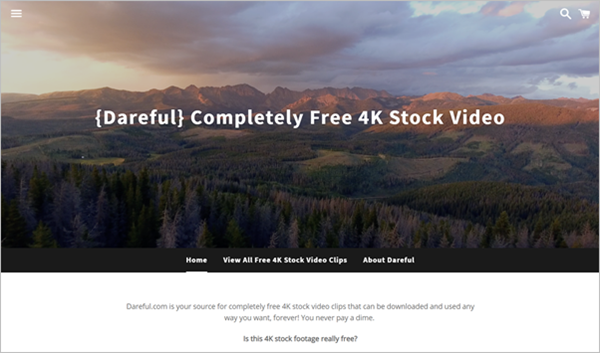 Dareful doesn’t have a huge collection of stock footage compared to other sites in this list, but all the 4k stock videos available on the sites are more qualitative and are tailor-made for you needs. There are free stock videos of nature, animals, fireworks, drone videos, city 4K footage, bokeh lights and many more like travel stock videos, time lapse nature videos. All the videos are 100% royalty-free and free to download, you can use them for personal and commercial purpose. Life of Vids is a website which has a large collection of stock footage to be used for commercial and personal purpose in HD quality. You can download the stock videos in whatever quality you like from the given download quality option. 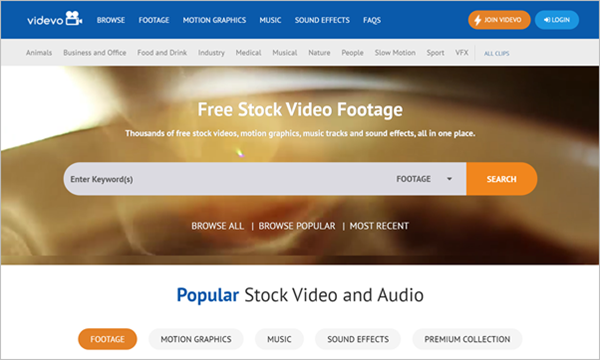 You can download 4K stock videos for free from the various categories offered by the site. These are totally license-free videos with no copyright. If you are happy with the contents you can make donation to them as appreciation. You can also submit your own stock videos and clips. These are our hand-picked websites to free download stock videos royalty-free in 4K and Ultra HD. You don’t need license or don’t have to deal with any copyright issue. You can find stock videos for web header, project in 4K or Ultra HD quality for free. Share this article with your colleagues, friends and clients so they can have easy access to free 4K Ultra HD stock footages. If you know any other sites for this purpose, please feel free to share them in comment section below. Any feedback and appreciation is welcome.